ANUSA will symbolically support the National Union of Students in 2017, but will not fund the Union until accountability, transparency and conduct conditions are met. Accreditation was passed by a vote of 24 for, 11 against, and 0 abstentions. Controversy surrounded the decision, and members of ANU Labor, Socialist Alternative and ANU Liberal Club, as well as SRC representatives, sparred over the National Union. Conduct at the meeting was civil, owing in part to rigorous chairing from General Secretary Kat Reed, and was marked by passionate speakers, and consistent applause from Labor attendees for pro-NUS speeches. 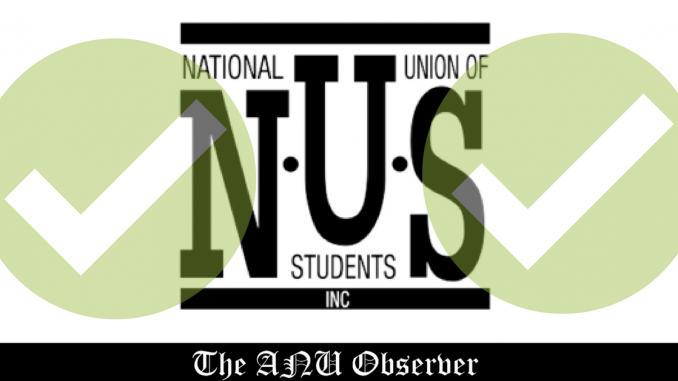 The ANUSA observers sent to National Conference in 2016 all spoke poorly of the conduct in their reports, and many, regardless of in-principle support for unionism, questioned the NUS’s effectiveness and acceptability given these problems. However, there were many strong advocates for the Union as well, especially from Labor factions and Socialist Alternative. Unlike some years, the 2016 ANUSA election did not feature a strongly pro- or anti-NUS ticket, so there was no clear voter mandate for the decision, although in an unscientific poll Observer conducted on ANU Stalkerspace last night, 69% of the 287 student respondents opposed accreditation. Wu strongly advocated for ANUSA’s ability to lobby federally without NUS. “Empirically”, Wu explained, “some of the most effective campaigns have been organised by individual campuses. In my experience as Ed Officer, we don’t need a national body to capture media interest … Boycotting NUS doesn’t mean opting out of activism,” and highlighted ANUSA’s centrelink debt and penalty rates campaigns. Labor attendees at SRC strongly contested this view- Briony Roelandts, ANU Labor Left President, rebuked Wu, proclaiming “ANUSA is a joke … there is no campaign on this campus that rivals NUS. The penalty rates campaign was not run by ANUSA, it was run by the power of the NUS.” Dom Cradick, NUS ACT Branch Ed Officer said “I don’t remember ANUSA reps sitting in front of senators, I don’t remember ANUSA reps organising mass protests, or lobbying the federal government.” However, Matthew Faltas and Ben Creelman later informed the SRC that the ANUSA President and Education Officer sat before a Senate Inquiry on fee deregulation in 2014, a claim Observer can confirm. While ANUSA now symbolically supports NUS, ANU students’ SSAF will not go to the Union yet. General Representative and NUS Observer Tom Kesina, seconded by Maclean, moved that the accreditation fee be paid only if NUS release minutes of meetings, formal records of votes, and appoint a non-factional returning officer to run elections, among other criteria. “That NUS can get away with not releasing minutes for executive meetings for over a year,” Kesina said, “is frankly shameful.” Kesina’s amendment was sucessful, and the fee will not be paid until conditions are met. The vote was conducted by secret ballot, a decision General Secretary Kat Reed said was to “ensure reps did not feel pressured by any external groups in the way they voted,” and instead voted according to their own judgement. However, several reps signed their names on their ballots. Each SRC member- the 7 ANUSA Departments, 6 Executives, 12 College Reps and 14 Gen Reps – had one vote. This report has been written in real-time, and in the interest of timely news has been released without thorough checking by multiple editors. We will fix any errors in the coming hours.